After her dream job shatters like Humpty's shell, psychic Jess Callahan returns home to Nocturne Falls to put her life back together and get her career back on track. Left heartbroken years ago by a shifter, Jess keeps anything or anyone supernatural at arm's distance; even turning her back on her gift. His career skyrocketing, falcon shifter Ryan Ford's life is just where he wants it. When the darkly handsome Ryan realizes that the one thing missing from his quiet, stay-to-himself world is the feisty red-haired Jess, he decides she'd be his perfect mate. When Jess finally opens her heart to Ryan, she also opens her clairvoyant channel. But will their love survive her catastrophic vision? 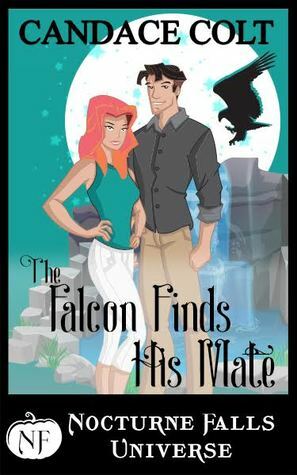 The Falcon Finds his Mate is a another great addition to the Nocturne Falls universe. This would be my first book from author Candace Colt, so thanks to Kristen Painter for having her write a story in her fictional town of Nocturne Falls. This book happens to start off slow a bit, but that didn’t stop me from swiping my kindle screen to get to the next page because I wanted to find out more about the main characters. I enjoyed getting to read a clairvoyant and a falcon shifter story this time around. Although, I didn’t like Ryan’s mom in the story at all. She’s very controlling of her Ryan and Conner, her other son that happens to be the ex of the female character in the story Jess Callahan. Candace takes the characters through a world wind of emotions because it’s unfortunately still not 100% over her ex, but she also can’t get over the fact that Ryan has grown up. I really liked Ryan in the story because of his persistence in the story. He didn’t want to give up. Overall this was an enjoyable addition to the Nocturne Falls series. I’m anxious to find out if Ryan’s brother ends up settling down because in the story he tended to be a player. At least he thought he was one. I give this book 4 stars and recommend it to fans of the Nocturne Falls series. It’s a quick book to read. I would’ve finished it in one day if it wasn’t for my busy work schedule. This Book Lovin’ Mama has needed some sleep.